The DDPai mini2 wi-fi dash cam records in 2K and the video quality is excellent. The videos are sharp and clear (when choosing the 1080P or 720P option). For smoother videos – I recommend choosing the 1080P recording option (it will also save you storage space, I will tell you more about this later on). The camera uses H.264 encoding and the CMOS sensor itself is very good – produces sharp images and videos. If you want even better video quality – check out the Z-Edge Z3 (Amazon link) dash cam. It also records in 2K, but in my opinion – the CMOS sensor it uses is a little bit better. Another great dash cam you may check out is Rexing V1 (Amazon link). This dash cam is super popular – probably one of the best sold dashcams out there. It offers great value for your money. It’s super easy to use and the video quality is really good. Currently it only supports 1080P resolution recording – but as I mentioned, in my opinion 1080P is the standart for recording – 2K takes too much space and the FPS rate (frames per second) is lower. The DDPai mini2 wi-fi dash cam comes without a MicroSD memory card, just like most other dashboard cameras out there. You have to buy it. The company recommended Kingston/Samsung memory cards. Amazingly, the DDPai mini2 dash cam supports MicroSD cards up to 128GB. That’s a huge advantage. Most dashcams only support memory cards up to 32GB, which for many – is very limiting. With the DDPai mini2 dashcam – you can use 64GB/128GB memory cards as well. That means you will be able to store much more video. While 128GB MicroSDs are fairly expensive, you can buy a good Samsung 64GB memory card online for fairly cheap. 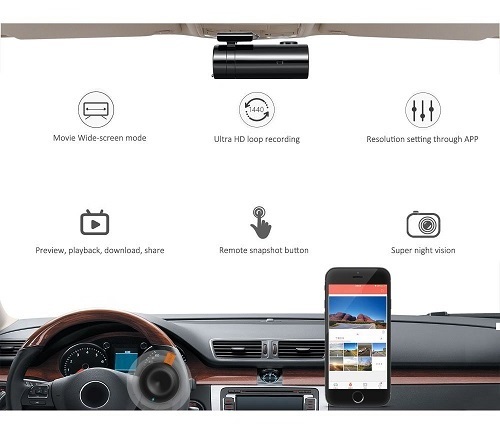 The DDPai mini2 dashcam comes with a remote “snapshot button”. When you press it – it captures a picture or 10 second video. Is it useful? Well, I can’t say for sure. Maybe for some people it will be very useful, but I persoanlly don’t think most people will use this button often. 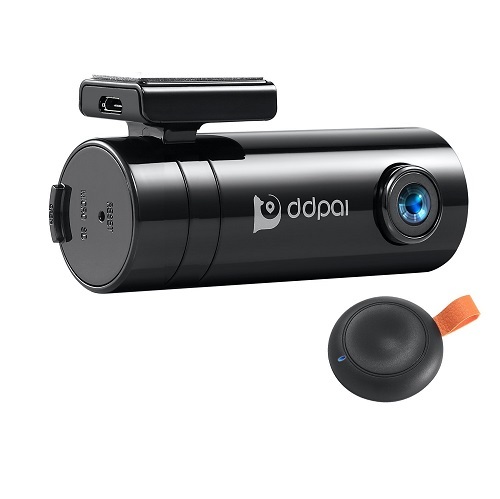 The DDPai mini2 dash cam has a built in G sensor with adjustable sensitivity. The way dashcams work is recording videos in loops and separating them into small video files. As soon as the camera runs out of storage space – it deletes the older video files and overwrites them. In a case of a collision or an accident – you want to prevent the recorded video from being deleted. The G sensor helps you with that. It detects the collision and “locks” the video files, so they won’t be deleted when the camera runs out of storage space. This is very important feature to have. If you are looking for a good dashboard camera with good video quality – DDPai mini2 is the right option. It’s easy to setup, works very well – and overall, provides great value for your money. I hope you will find my DDPai mini2 wifi dash cam review helpful. If you have any questions – feel free to comment below .Also, make sure to check out other useful dash cam reviews on our website.